This is used to select outside (fresh) air position or recirculated air position. To change the air intake control position, push the control button. The indicator light on the button is illuminated when the recirculated air position is selected. 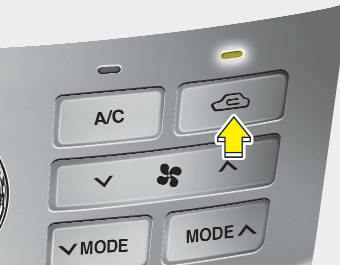 The indicator light on the button is not illumimated when the outside (fresh) air position is selected. Do not sleep in a vehicle with air conditioning or heating system on. It may cause serious harm or death due to a drop in the oxygen level and/or body temperature. Continued climate control system operation in the reciruclated air position can cause drowsiness or sleepiness, and loss of vehicle control. Set the air intake control to the outside (fresh) air position as much as possible while driving.